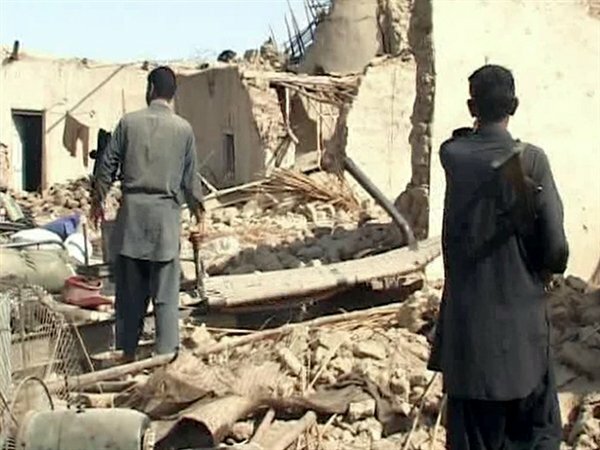 At least 238 people have been killed after a powerful earthquake hit Pakistan’s remote south-west province of Balochistan. The 7.7-magnitude quake struck on Tuesday afternoon at a depth of 13 miles north-east of Awaran, the US Geological Survey said. Many houses were flattened and thousands of people have spent the night in the open. After the quake, a small island appeared off the coast near the port of Gwadar, witnesses reported. People gathered on the beach to see the new island, which is about 30ft high and 300ft long, Gwadar Police Chief Pervez Umrani said. Balochistan is Pakistan’s largest but least populated province. The latest quake was so powerful it was felt as far away as Karachi, Hyderabad, and India’s capital, Delhi. Entire villages are reported to have been flattened in the impoverished and sparsely-populated district of Awaran. Balochistan government spokesman Jan Buledi put the death toll at 238, more than 200 of the fatalities in Awaran town and the surrounding villages. He has warned that it could rise. At least 340 people have been injured. “We are seriously lacking medical facilities and there is no space to treat injured people in the local hospitals,” Jan Buledi said. He said helicopters were airlifting the most seriously injured to Karachi while others were being cared for in neighboring districts. Pakistan’s military was among the first to respond to the crisis, having a heavy presence in the area already because it is fighting a long-running separatist Baloch insurgency. The army said it had sent more than 200 soldiers, medical teams and tents from the regional capital Quetta, but the mountainous terrain is said to be hampering the rescue operation. Awaran local government official Abdul Rasheed Baluch said around 90% of houses in the district had been destroyed. “Almost all the mud houses have collapsed. We have been busy in rescue efforts for the whole night and fear we will recover more dead bodies from under the rubble during daylight,” he said. Many of the casualties are said to be from Labach, on the northern outskirts of Awaran town. Houses are also reported to have caved in the district of Khuzdar. An emergency has been declared in Awaran and another earthquake-affected district, Chagai.